Effects Pedal Mods in New Zealand ! This mod gives a whole new meaning to the word ‘distortion’ and absolutely nails the ‘Marshall Stack in a Box’ sound. 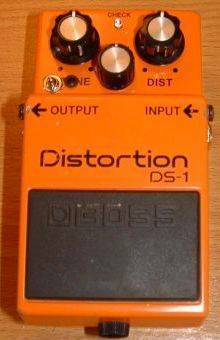 The mod first of all changes your Made in Taiwan DS1 to replicate the tone of a Made In Japan model and then installs all the hardware and electronic components needed to make the changes to give the Boss DS1 a more usable tone range than the stock pedal can offer. This kit includes the Drench Mod which is a toggle switch added to change between Sheepdip and Drench mod. Comes with an extra bright blue L.E.D and brand new 9 volt battery. Sound samples for both the standard and modded version of the pedal are below. Questions are welcome but please check the Dexter Mods FAQ first. The mod is guaranteed and if there are any problems when you receive your pedal back simply return to me, I’ll service it, send it back and refund your shipping costs. Superb trader, repaired my wah to exceptional quality. Also, I’d paid for mods which couldn’t be done on my pedal, so was contacted and Dave arranged to give back the money not required for the job. Awesome bloke, great quality workmanship, and would trust without a doubt again and again! I can’t understand how you justify your prices! I didn’t read the auction, can I get a refund?